It seems like only a week ago the Dow closed at record highs. Wait, it was just a week ago on January 26th when the Dow closed at 26,616 and a new record. Today the index closed at 23,345 and 8.5% lower. We have almost had a 10% correction in just one week. Actually, a 10% correction would be a dip to 23,954 and the intraday low today was 23,923. Had we closed there it would have been official. We may get another chance on Tuesday. The S&P futures are down -50 as I type this. The Hong Kong Hang Senq is down -4.3%, Shanghai Composite is down -2.1% and the Nikkei is down -5.2%. The Dow futures are down -550 points. The odds are good we will get a good retest of the Monday lows. In theory, this could produce a bounce but theory never seems to work in practice. There was on directly attributable cause for the Monday crash. It was simply a continuation of the Friday decline and a bunch of technical levels were broken. The 50-day average on the Dow and S&P was broken like a twig along with multiple support levels to trigger millions of stop losses. Margin calls started the decline at the open and then increased the velocity a 2:PM. I am sure there will be another flurry of forced margin selling at the open on Tuesday. Historically, whenever there has been a major market meltdown, the indexes are higher a week later. In our case today, investors have been waiting for a dip to buy for the last six months and now that they have one, there are no bids. Everyone is afraid to try and catch a falling knife. Volume was very heavy today at 11.5 billion shares. Decliners were 7:1 over advancers and volume was nearly 7:1 declining over advancing. The volatility indexes exploded higher. The VIX spiked 20 points to close at 37.32. That is the highest close since 2011. The XIV ETN, which is the inverse of the VIX, crashed back to $99 in regular trading. This ETF rises when volatility goes down. 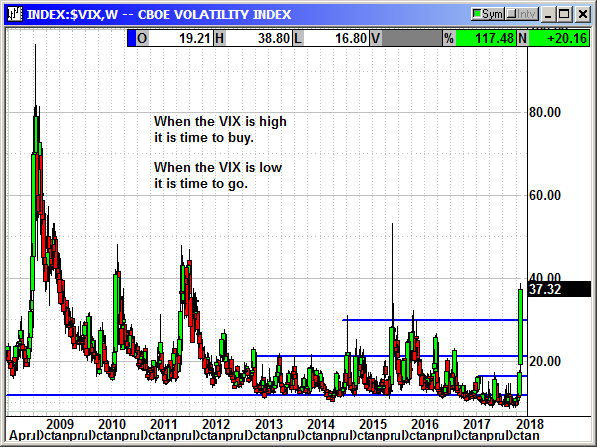 It falls when volatility rises. After the close, the ETN collapsed to $15. I was going to recommend we buy this ETN at the open on Tuesday. However, there are rumors that this ETN and other volatility ETNs may have blowup and the banks behind them are liquidating. 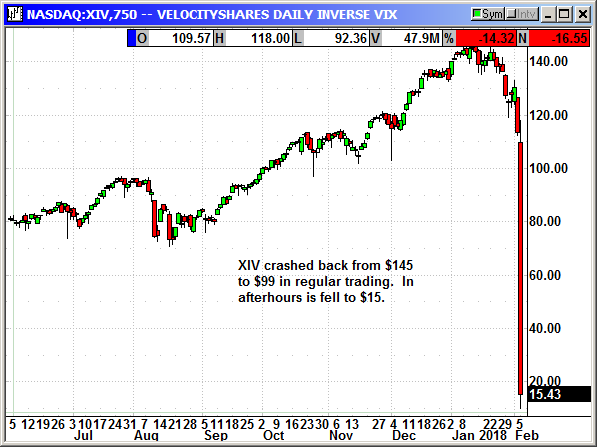 Credit Suisse is rumored to have lost $500 million on the XIV alone on Monday. If it still exists at the open on Tuesday, it may be worth putting a few dollars on it as a lottery play. Credit Suisse said in a note that there was nothing wrong with it only the extreme volatility had crashed the price. 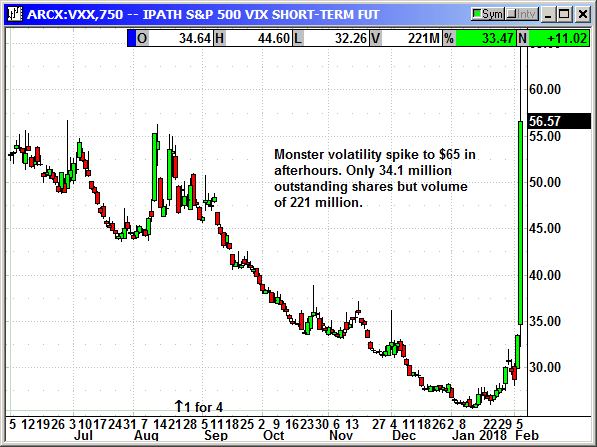 The VIX Futures ETV (VXX) spiked from the close at $43 to $65 in afterhours. The ETF has 34.1 million shares outstanding and ShortSqueeze.com says there are 32.5 million sold short. The volume on Monday was 221 million. That means more than 5 times the outstanding shares were traded. 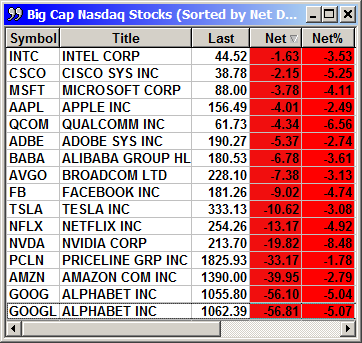 This is a favorite of the algo computers so they were hitting it hard today. 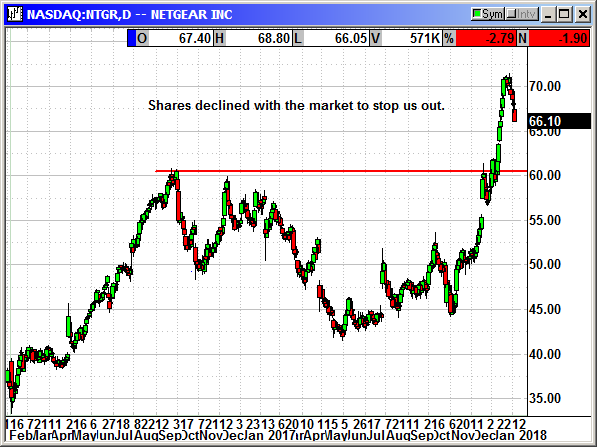 If you have a big account I would strongly recommend shorting this ETF at the open on Tuesday. This ETF is flawed. It is a futures ETF so every month it declines as the futures roll over. It has done four 1:4 reverse splits in the last four years as it declines to $10 then reverse splits and starts all over. The last 1:4 was in August. 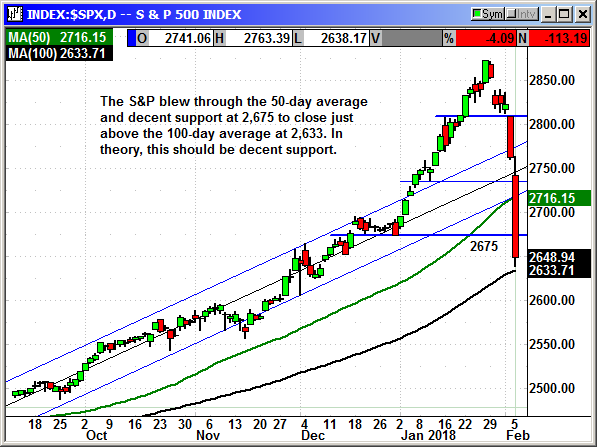 The S&P blew through support at the 50-day and again at 2,675. Those are levels we would not even have considered possible a week ago. The 100-day at 2,633 should be tested at the open on Tuesday. That should be decent support but a tsunami of selling could blow through that level as well. The Dow component table is missing any green with every component contributing to the decline. Intel and Pfizer were positive for part of the day but eventually lost the battle. At the intraday lows the Dow was down -10% from the highs. That number is 23,954 and the low today was 23,924. 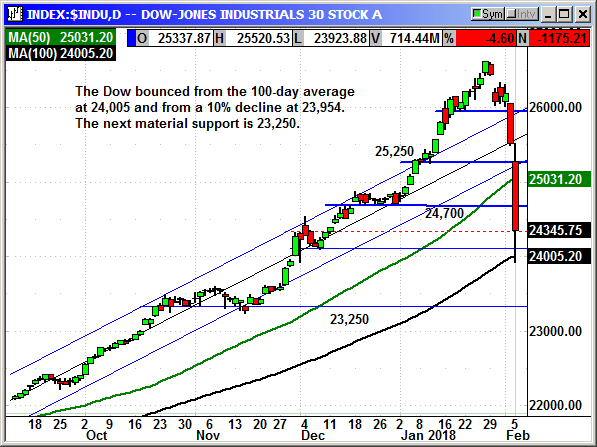 The Dow bounced from that level and from the support of the 100-day average at 24,005. Whether those levels will matter on Tuesday is a coin toss. With the Dow futures down over -565 points Monday night, it could be another big loss. 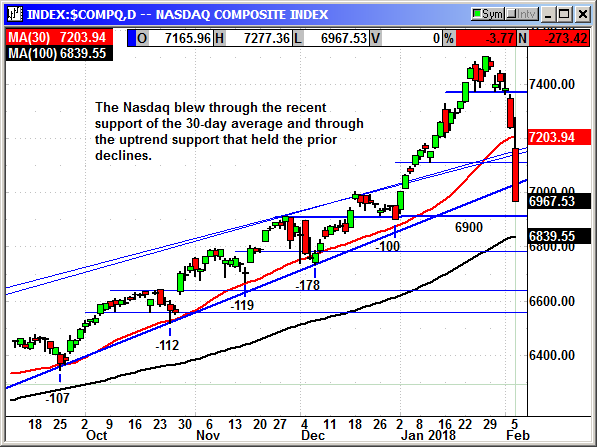 The Nasdaq blew through the prior support of the 30-day average and through uptrend support that held all prior declines. The -273 loss for the day was amazing. Next support is 6,900 and the 100-day at 6,839. The big cap techs are being flushed by funds as they try to capture any remaining profit from their six months of gains. The Russell 2000 has fallen farther than the big caps. 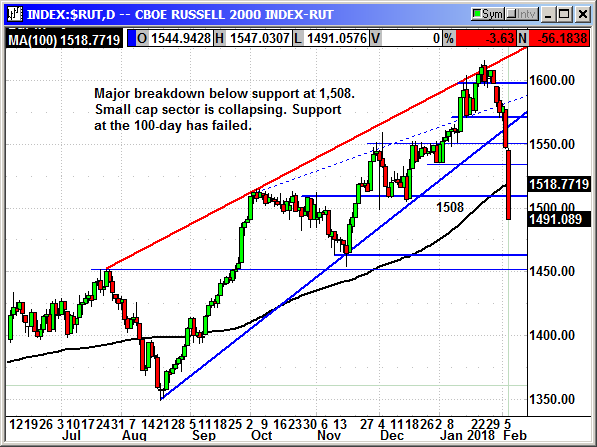 The 100-day average has already been broken as well as support at 1,508. The next material support could be 1,465 followed by 1,450. 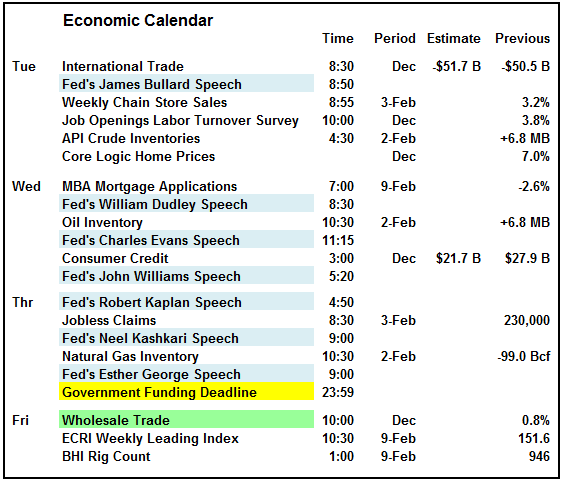 The calendar for the rest of the week is uneventful with the exception of the government funding deadline on Thursday. Lawmakers are going to try and kick the can farther down the road to March 22nd but it looks questionable as of Monday. The earnings reporters for Tuesday probably wish they could reschedule. Disney is a Dow component but it will not make any difference to the index. These reporters will be ignored and buried under another flood of negative market stories instead. The S&P futures are down -75 right now at 11:30 ET. While that could change by morning, I would not hold my breath. I did recommend a new position on ABBV in hopes we can buy it even lower on another negative open. I would like to buy the dip but in these kinds of declines, further damage could be done before a rebound appears. There is always another day to trade if you have money in your account. I am recommending a new position on ABBV thanks to the market volatility erasing the post earnings spike. I recommend waitin at least 5 minutes after the open to place your order. Futures are down hard so we should open lower. Buy May $115 call, currently $5.95, no stop loss because of volatility. The long call position was entered on Tuesday, stopped on Monday. 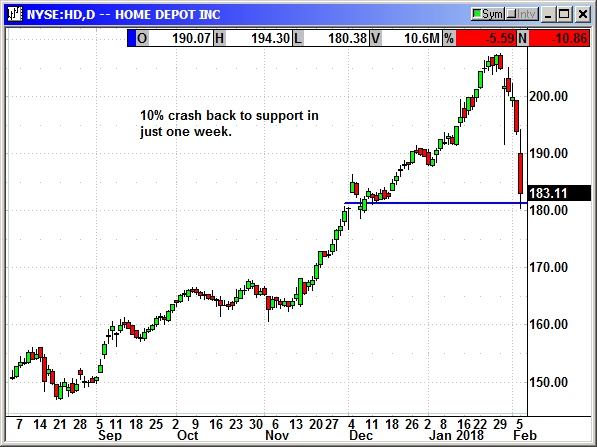 The long call position was stopped at $110.65 on Monday. 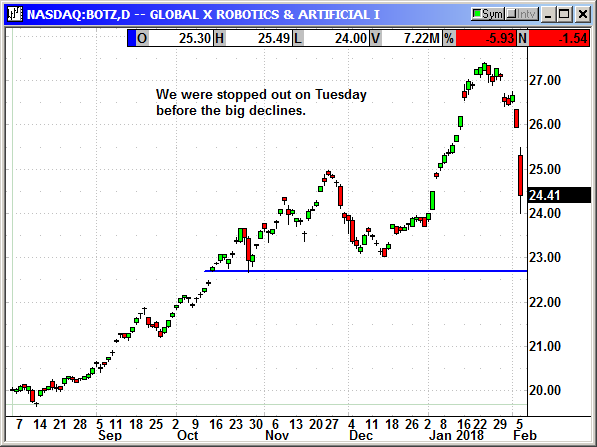 The long call position was stopped at $26.45 on Tuesday. The long call position was stopped at $112.50 on Thursday. The long call position was stopped at $203.25 on Tuesday. The long call position was stopped at $68.75 on Thursday. No specific news. 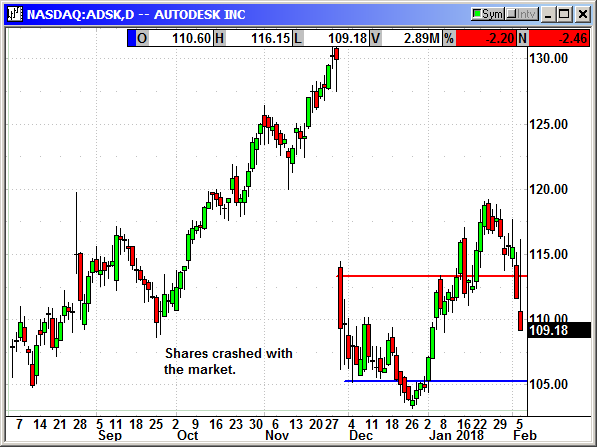 ADSK was hit by the market volatility to stop us out on Monday. Long March $120 call @ $4.19, exit $2.50, -1.69 loss. Closed 2/5: Short March $130 call @ $1.45, exit .90, +.44 gain. No specific news. 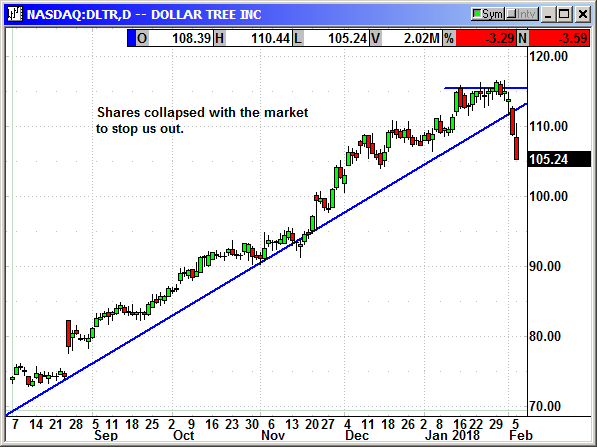 The ETF was stopped out on Tuesday before the big declines began. We still posted a 107% gain. Closed 1/30: Long June $24 call @ $1.45. exit $3.00, +$1.55 gain. No specific news. Strictly a market volatility crash to stop us out on Thursday. Closed 2/1: Long March $120 call @ $3.05, exit $2.31, -.74 loss. No specific news. 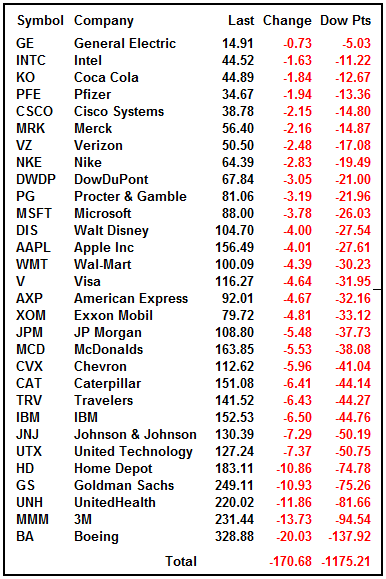 HD, a Dow component, crashed with the market to stop us out. No specific news. 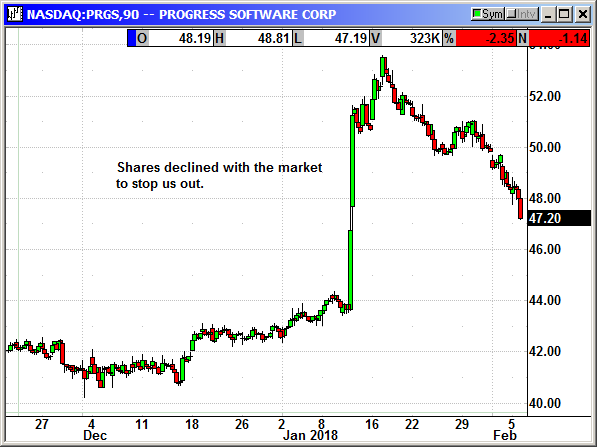 Shares crashed with the market to stop us out. Closed 2/1: Long Mar $65 call @ $2.25, exit $6.10, +$3.85 gain. 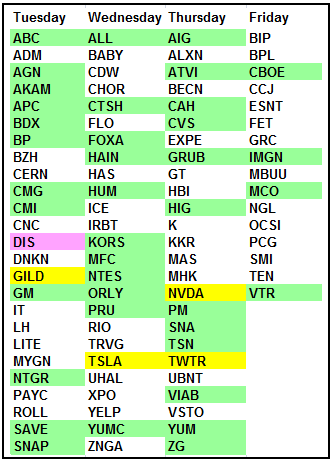 Closed 2/5: Long June $55 call @ $2.00, exit .75, -1.25 loss.